Flutter, the new UI toolkit from Google is the latest buzzing tech in mobile app development. Though its first stable release- Flutter 1.0 is just around a month old, Google has been slowly building up support since its earliest beta version unveiled way back in 2017. It is owing to this effort that even this brand new toolkit has already built some very impressive apps. But why exactly is Flutter such a big deal? We have, after all, many frameworks to build hybrid apps. The reason is, Flutter makes the task a lot easier and delivers exceedingly better performance than all other frameworks. It has, in fact, come out on top in its comparison to React Native- considered the best hybrid app development framework. For the downside, Flutter doesn’t really have many flaws except for the lack of libraries and compatibility that would be addressed over time. There is, however, one point worth mentioning here- Google has a habit of killing products. And it is perhaps to address that fear; Google has tried hard and brought prominent businesses onboard even before the first stable release of Flutter. What better way to show its trust in Flutter than to use it on one of its key products! Google Ads is the company’s app for businesses to manage their online advertisements. 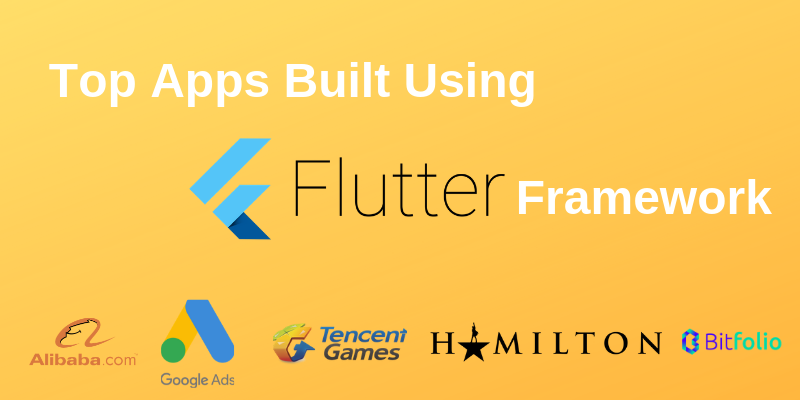 Built on Flutter, this feature-rich application includes a complete dashboard for users to monitor and manage each metric of their advertisement campaign. If you don’t already know, Alibaba is one of the largest online retailers, often dubbed as the Amazon of China. It has used Flutter to build one of its local Xianyu app that has to date over 50 million downloads! The fact that flutter has seamlessly handled such scale lends it quite an edge for building full-scale applications. You might not have even head of Tencent but it is currently the largest gaming company in the world that particularly specializes in mobile games. It too has used Flutter to overhaul one of its popular video streaming application- NOW Live. The app, with tens of millions of users, is one of the finest examples of an entertainment app. It is the official app of Broadway musical Hamilton. The intuitively designed application includes a news section, trivia games, lottery, merchandise store, and more. Bitfolio is a cryptocurrency portfolio management app that allows users to keep track of their investments in various cryptocurrencies including Bitcoin, Ethereum, and Litecoin. With features like real-time price updates and market charts, it’s quite a demanding application that is seamlessly handled by Flutter. Now if you carefully look at all the applications above, you’d notice the immense diversity in the type of products built through Flutter. For shopping applications and video streaming to Bitcoin and CRM, there is hardly any mobile app segment that Flutter hasn’t touched- that too within its beta stage! And now that its stable release- Flutter 1.0 is out, we expect it to soon become a prominent player in cross-platform mobile app development.